I'm hot 'cause I'm fly. You ain't 'cause you not! The sensation of “heat” in food is caused by a group of compounds called capsaicinoids, the most representative being (XV) Capsaicin. 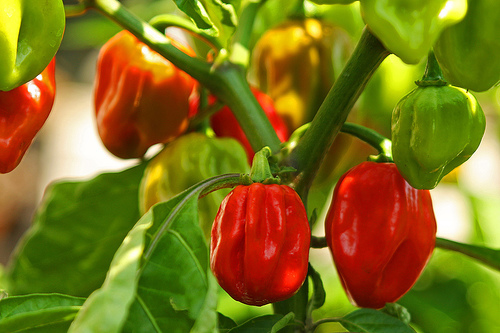 Capsaicin molecules stimulate pain receptors on your tongue, which transmits burning sensation to the brain. The concentration of capsaicin in the chili pepper family (Capsicum sp.) varies, and the heat intensity is subjectively measured in Scoville heat units (SHU). A red bell pepper has a very low Scoville rating, while Habanero peppers can be between 200,000 to 300,000 SHU. Pure capsaicin has a rating of 16,000,000 SHU. Capsaicin is soluble in alcohol, which ideally would justify pairing beer with spicy food. However, even a strong beer is over 90% water, which will do little to quell the pain. Carbonated drinks such as beer and soda will further irritate the pain receptors as well. Hard liquor (ie. tequila) will probably do the trick, but you would have to drink a lot of it to have any effect. Caution: your brain will be numb long before your tongue. Capsaicins are lipid-soluble molecules, and have a very high affinity for dairy fats. Milk and sour cream are bound to casein, a lipophilic protein that binds with capsaicin and allows it to be washed from the tongue. The monounsaturated fatty acids found in avocado will also provide a welcome relief from the burning sensation. This recipe makes a LOT of nachos, so make sure you have some friends around. Tequila and Mezcal are both distilled liquors produced from the maguey (agave) plant. Tequila is produced from only the blue agave plant in the Jalisco province. In contrast, Mezcal can be produced anywhere in the country from multiple agave varieties. Habanero peppers - NOT the hottest. Try the Trinidad Moruga Scorpion and then talk. If you can form intelligible words. Arrange a mixture of 2 varieties of corn chips on two large baking sheets. Evenly distribute shredded Pepperjack and smoked cheddar cheeses over both pans of corn chips. Top with black olives and jalapeno peppers. Bake for 10-15 minutes until cheese is melted. Remove from oven for nacho assembly. Heat a medium non-stick skillet over medium high heat. Add oil, garlic, onion and peppers to the pan and saute 2 minutes, then add meat and crumble with wooden spoon. Season meat with salt, chili powder, cumin and cayenne pepper. Continue to cook until well done, then reduce heat to low. Whisk flour into butter to form a roux. Cook for 2 minutes until golden in color. Gradually pour beer into the roux and whisk to combine. Continue to cook, whisking occasionally until sauce begins to thicken, about 5-10 minutes. When sauce has thickened, add shredded cheese and whisk to combine. Remove cheese sauce from heat. To serve, and top with half of the cheese sauce. Arrange half of the cooked beef over the first layer of chips. Arrange remaining chips over the first layer of nachos. Top with remaining cheese sauce and beef. Serve with salsa fresca, tequila guacamole, and sour cream. Serves less people than you would expect. Scooped avocado pulp into a large bowl. Add lime juice and tequila. Toss to coat. Mash avocado pulp with a fork or potato-masher. Add salt and continue to mash. Cover and refrigerate at least 30 minutes before serving. Garnish with the worm – if you dare. 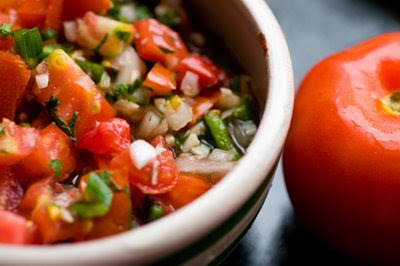 Pico de Gallo. Translation: Rooster's Beak? Dice tomatoes and place in large mixing bowl. Finely dice white onion and add to bowl. Remove stems of cilantro and finely mince. Stir into tomatoes and onions. Grate lime peel and juice the lime, adding the grated zest and juice to the mixture prepared. Season with salt and black pepper and stir ingredients until well combined. Damodaran, S. (2008). Fennema's Food Chemistry, Fourth Edition. Great blog post! I originally came for the picture of Capsaicin because I'm analyzing it in my organic chemistry class, but I am very familiar with making Roux sauces and I love nachos... I probably will do nacho night with the guys now. Please Sir, Can I Have S'more?